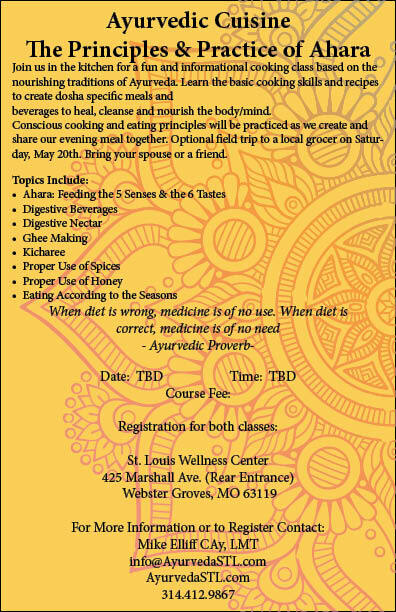 Welcome to Ayurveda St. Louis, the area's resource for the Principles and Practice of Ayurveda. Ayurveda is defined as the "science of life" or the "art and science of life and longevity". Its purpose is to heal the body/mind, maintain life and increase the health and longevity of each individual. Originating in India it is the sister science to yoga. Ayurveda focuses on the "art of daily living" and is unique to each individual. The principles of Ayurveda have remained unchanged for thousands of years and are regarded as giving birth to modern medicinal and surgical practices. Ayurveda places great importance on the maintenance of health through dietary and lifestyle practices. Proper exercise, yoga, bio-individual nutrition/cooking methods, meditation and herbal regimens are designed according to each individual's prakruti (constitution) and vikriti (current imbalance). Ayurveda looks deeply into the client's history, environment and lifestyle choices, educating the individual to make choices that will lead to greater physical, mental and spiritual health and well-being. Our journey begins by understanding our unique constitution (prakruti) or genetic make-up determined at the time of conception. It is the genetic/elemental blueprint that determines our psycho-physiological responses to our environment. How each individual responds to physical/emotional stress, food choices, traumas and seasonal changes, directly affects one's state of health. Given this information, we can then make informed choices to minimize or eliminate the habits that create imbalance. The modern world presents us with stresses and challenges that disturb our internal and external balance. This deviation from our constitutional balance (vikriti) may lead to physical/emotional imbalance or disease. The principles and practice of Ayurveda enable us to gain awareness and control over these factors and facilitate optimal health, well-being and prevention of disease. The ancient texts of Ayurveda describe three functional principles or energetic expressions that are present in everyone and everything. Vata is the principle of movement, Pitta the principle of digestion and metabolism and Kapha the energy of structure and lubrication. Ayurveda views the disease process as an excess or deficiency of VPK at the cellular level. Creation of health or disease is dependent upon the dietary/lifestyle choices we make and their direct effect on these three principles. Vata is the energetic expression of movement. It governs respiration, pulsation of the heart, muscle and tissue movement and all movement at the cellular level. In balance Vata is responsible for creativity and flexibility. Signs of imbalance manifest as fear and anxiety. Pitta is the energetic expression of the metabolic processes at the gross and cellular level. Pitta directs the processes of digestion, absorption, assimilation, nutrition, metabolism and body temperature. Balanced Pitta promotes intelligence and understanding while an imbalanced state produces anger, jealousy and hatred. Kapha is the energetic expression of structure and lubrication. Kapha supports and gives structure to the body and manifests as bones, muscles and tendons. It is responsible for supplying fluids to all bodily structures. An Ayurvedic practitioner uses signs and symptoms of balance/imbalance to consider the appropriate diet, lifestyle, herbal regimens and therapies through direct questioning, observation and physical examination. I encourage you to explore the contents of this site and the wealth of information that Ayurveda offers to address your specific needs. A typical Ayurvedic consultation consists of an initial phone interview followed by the client filling out an extensive intake form. We will then schedule an interview and physical examination which typically takes 1 to 1½ hours. Given the findings, a practitioner will make recommendations to start you off on the path to wellness given your current state of health (vikriti). I will prepare an individual dietary/lifestyle/herbal protocol based on the principles of Ayurveda and we will meet again to review the findings. Abhyangha, Garshana, Shirodhara, Basti(external), Nasya, Jala-neti, Vishesh, Udvartana, and Swedana. For treatment descriptions and pricing, see the Treatments Page. Ayurveda recognizes the unique qualities of each individual. Bodywork sessions are designed to meet the needs of the client and are tailored according to intention, pressure, pace and herbalized oils used in each session. Determinant factors include the strength of the client, inherent nature (prakriti),current imbalance (vikriti) and the season. An eclectic blend of Eastern and Western techniques acquired over the past 22 years of practice. Treatment involves addressing the specific needs of the client to maintain a balanced and functional structure. Massage is a central feature of Ayurvedic medicine as it cleanses the body, regulates the doshas by moving displaced doshas back into the digestive tract and nourishes the skin. Abhyangha promotes good vision, sound sleep, reduces vatagenic qualities and protects us from the aging process. It stimulates lymphatic circulation assisting the liver and kidneys in the bodily detoxification process. Performed by a trained therapist, a warm, herbal infused oil specific to the client's needs is applied liberally to the body. Special attention is paid to the areas of the body where each dosha resides. Based on the practice of LaStone Therapy developed by Mary Hannigan, this treatment involves the application of geo-thermotherapy utilizing heated basalt stones and chilled marble stones to affect physiological change within the body/mind. 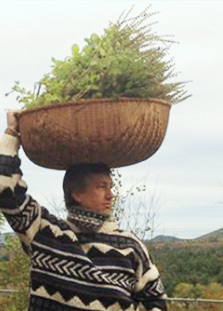 The body is prepared to receive the stones with the application of an herbalized oil specific to the client's needs. Stones of varying weight and temperature will be placed used to massage the body inviting psycho-physiological change. Varying temperature and pressure generates vascular gymnastics, deep fascial/muscular release and an overall sense of well being. * I have been credited by Mary with coining the term geo-thermotherapy. Geo - Stones, Thermo - temperature, Therapy - the therapeutic application of the stones. Garshana means "rubbing". A form of external exfoliation and lymphatic stimulation performed by a therapist using raw silk gloves. The brisk rubbing of raw silk over the body creates heat, exfoliates dead skin cells and prepares the body to deeply receive nourishment during abhyangha. An additional benefit of this treatment in the production of static electricity creating an ionization and alkalizing effect on the channels of circulation and the lymphatic system, aiding in waste removal. Garshana improves circulation of the srotas (channels), initiates the flow of the five vayus (movements within the body) which initiates the activation of the nadis. This has a beneficial effect on both the nadis and the chakras as both operate within the electromagnetic field of the body (pranamaya kosha). "The Queen of Ayurvedic Oil Therapies"
This treatment involves pouring a warm stream of herbalized oil over the clients forehead. Also known as bliss therapy, shirodhara is one of the most powerful treatments to relieve vata in the mind. Excess vata in the mind manifests as stress, anxiety, depression, insomnia, fatigue and psychological disorders. Given that 80% of all diseases in the West are stress related, shirodhara becomes one of the most important treatments Ayurveda offers. Shirodhara works mainly on the mental sheath (manomaya kosha) where the mind holds on to past impressions, imbalanced desires and habitual behavioral patterns. When oil is poured on the forehead, the nervous system is stilled and impressions held deeply in the limbic system are released. This "quieting" of the brain allows the pranavaha and manovaha srotas to effectively transport prana, oxygen and nutrients to the brain. Results of this treatment include: improved ability to handle stress, mood stabilization, better cognitive function, and removal of deep seated patterns that cause emotional distortion. Successive treatments achieve deeper states and healing becomes spontaneous as the wisdom of the body awakens. 60 minute treatment - $90 plus the cost of the recommended oil (oil can be reused up to three times). A unique treatment that induces sweating by passing steam over the entire body or a specific region. Nadi Swedan relieves pain, reduce stiffness in the joints/musculature and improves circulation allowing herbalized oils to deeply penetrate into the channels and tissues of the body. Ayurvedic texts offer a class of nutritive, palliative basti applied externally to localized areas of the body. Medicated oils are retained on the surface of the body and are classified according to the site of administration. A dough dam is created and applied to the area of the body being treated. Warm herbalised oils or ghee are administered to the region and held for an extended period of time. Different applications have different effects depending on the site, duration and oils used. Netra basti or netra tarpana is the introduction of ghee or medicated ghee to the eyes. This treatment reduces pitta in the eyes, alleviates nasal congestion, relieves headaches, removes eye strain, improves vision and cleanses the door of visual perception. Kati basti is applied to the lumbo-sacral region. Benefits of this treatment include reduction of muscle spasm, rigidity and pain associated with spinal maladies and treats numbness, tingling and sciatic associated pain. Hrid basti applied to the cardiac region nourishes the pericardium, myocardium, heart and emotional conditions. Janu basti applied to the knee for all associated conditions. Nabhi basti is applied over the navel and is indicated when the digestive fire is low (agni) to stimulate digestion and assimilation, regulates the function of the abdominal organs, relieves abdominal pain and distention caused by stagnation and congestion. Prustha basti applied to the thoraco-lumbar region lubricates the intrvertebral, arachnoid and sub-dural spaces. Its effect on the nerve ganglia clears blockages in the chakras. Nasya involves a vigorous massage to the head, neck and shoulders followed by the client's introduction of oil/herbalized oils into the nasal passages directly affecting the mind and consciousness. General indications include migraine, pain, vata disorders in the supra-clavicular region, tonsilitis and pain. Vishesh involves a deeper massage technique that loosens impurities and facial restrictions in the superficial/deep tissues. Vigorous rhythmic massage with warm herbalized oil relieves muscle aches and pains, mental tension and stiffness in the joints. Udvartina utilizes herbal powders and warm oils to exfoliate, stimulate lymphatic flow and deeply cleanse the tissues of metabolic wastes. Indicated for lymphatic congestion, detoxification/cleansing and certain skin conditions. Swedana, an herbalized full body steam treatment deeply clears excess heat and toxins from the tissues, stimulates the lymphatic system, revitalizes the skin and is balancing to all body types. 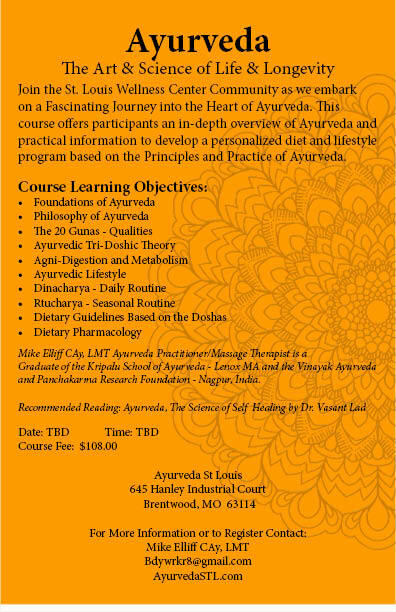 Ayurveda is a system of interrelated practices that affect every aspect of a person's health and well-being. Ayurvedic adherants have utilised patient, careful observation and systematic exploration of dietary and lifestyle practices for centuries. Thus, Ayurveda is the oldest, continuously practiced form of healing on the planet. As relevant today as it was for the ancients, Ayurveda is applicable to the rigors and stresses of life in the 21st century. This natural healing method is undergoing a renaissance here in the United States as health care costs rise and prevention becomes the responsibility of the individual. The system or science of Ayurveda incorporates diet, exercise, daily activities, psychotherapeutic practices, massage, botanical medicine and the uniqueness of the individual to awaken the wisdom of the body. 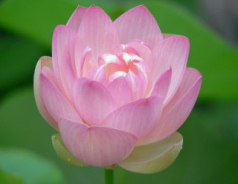 Ayurveda views each person as an individual that is part of, not seperate from the natural world. To understand your individuality is the foundation of life, health and happiness. A basic tenet of the practice of Ayurveda "like increases like" empowers one who understands his uniqueness, basic nature and inherent qualities to make healthy dietary and lifestyle choices. Using an energetic model or the tri-doshic theory of Ayurveda, the energetics of the individual and their imbalance can be described and appropriate measures taken to restore ones's balanced state of health. This dish is known as the supreme Ayurvedic rejuvenation treatment. Kichari is balancing to all three doshas. It is served to those undergoing panchakarma treatment, persons with delicate digestion and those healing from illness. There are many variations and recipes for this dish. You may expand on the dish by adding your favorite vegetables and spices specific to your current condition. Bring the rice, beans and water to a boil in a medium sized pot. Cover and reduce heat. Simmer until dal is tender, all the water is absorbed, and the mixture takes on the consistency of porridge.Stir occaisonally and stay alert so the mixture doesn't stick to the bottom of the pan. 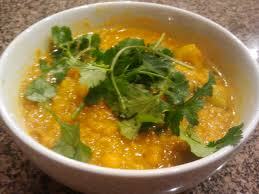 Depending on the freshness of the mung dal this can take from an hour to an hour and a half. Heat the ghee in a small skillet. Add all ingredients except the turmeric and wait for the mustard seeds to "dance". Add mixture and turmeric to the kichari. Be sure to watch the video posted on the home page. Heat one pound of organic, unsalted butter over a low flame. 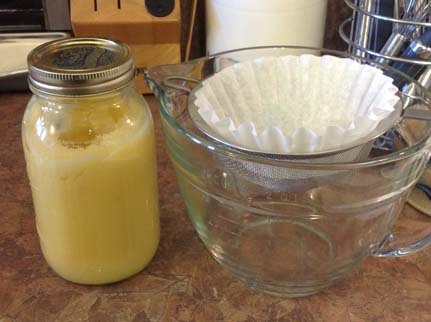 Keep the heat on low and keep a close eye on the ghee as the milk solids seperate. Cook the butter until it is clear and golden. 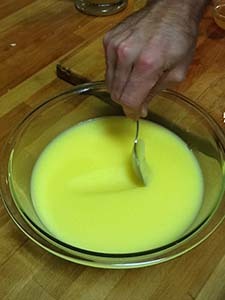 As the ghee cooks the milk solids will develop a foam on the surface, do not skim. Check the ghee frequently. When a golden crust develops on the bottom of the pan, remove from the heat. Line a seive with a coffee filter or three layres of cheese-cloth. Set it over a glass measuring cup or pot and strain. Pour the finished product into a clean, sterilized jar. Ghee does not need to be refrigerated. 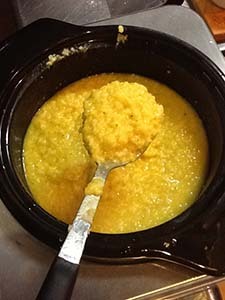 Use a clean spoon each time you remove ghee from the jar as moisture will spoil the product. Keep jar closed tightly. Please feel free to contact us if you have questions or need additional information of any kind. If you would like to make an appointment, included your contact information below and I will contact you in a timely manner. If you would prefer to call, you can reach me at 314-412-9867 to schedule an appointment.